Foods have a great effect on your body as well as mind. Thus, there is a stress on adopting a healthy diet for healthy living. Speaking of stress, it has become quite a common problem nowadays, owing to the busy and hectic lifestyle in today’s world. 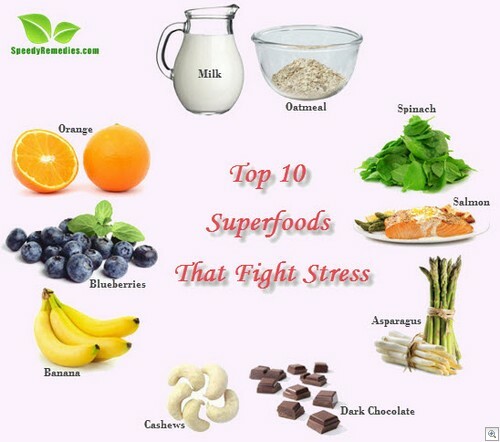 Hence, the easiest way to combat stress is to opt for foods, or rather superfoods that can fight stress effectively. Superfoods, in particular, are beneficial because of their high phytonutrient content. Binging on mere ‘comfort foods’ can be comforting temporarily but they are likely to cause more stress afterwards. Here is a list of top 10 superfoods that can help reduce stress. Orange is one of the most popular superfoods that fight stress. It is loaded with antioxidants, especially vitamin C which reduces physical as well as psychological effects of stress. Studies have shown that during situations posing psychological challenges, individuals taking adequate amount of vitamin C experience fewer or lesser degree of signs of stress (for example, high blood pressure) as compared to those who do not take this vitamin. Moreover, vitamin C helps your body combat stress by regulating the primary stress hormone called cortisol. In addition, the citrus smell of orange reduces stress and anxiety. Blueberries have stress-relieving properties due to their high antioxidant content. Furthermore, they slow down the process of aging and protect against conditions like heart disease, stroke, and cancer. Studies indicate that blueberries also protect the brain from toxic stress. So, you can enjoy munching on a handful of blueberries, whether fresh or frozen. In addition, you may add the berries in your yogurt, cereal, muffins, and other filling snacks. Banana is an easily digestible superfood loaded with potassium. It has been observed that during stressful times, there is a decrease in potassium levels in the body. In addition, this mineral helps lower high blood pressure. Besides, eating bananas benefits in relieving issues like constipation, heartburn, diarrhea, depression, hangover, peptic ulcers, PMS, morning sickness, etc. Being rich in potassium, banana can prove useful in controlling the effects of nicotine withdrawal as well. Dark chocolate is a delicious and mood-boosting food. It helps ease emotional stress and lowers blood pressure. Basically, it reduces the hormones released by the adrenal glands that cause stress. Plus, it increases serotonin levels in the brain, thereby stabilizing your mood swings. Serotonin is a neurotransmitter that regulate mood, appetite, sleep, and memory. Consuming dark chocolate in moderation also regulates the metabolism, and lowers the risk of heart attack and stroke. Dark chocolate, however, is a common comfort food that you tend to get addicted to. Hence, do not rely heavily on this superfood. Another easy way to combat stress involves snacking on a handful of cashews. They are rich in zinc, which is considered good for stress-relief. In fact, low levels of this important mineral are often associated with stress and anxiety. Furthermore, other nuts like almonds, pistachios, walnuts, and so on are also considered beneficial in this regard. When taken in moderation, these nuts help lower blood cholesterol levels as well. Oatmeal works as wonderful stress-busting food because it is packed with B vitamins that stimulate the serotonin levels in the brain. The fact that it gets digested slowly allows your body to absorb this neurotransmitter steadily. Moreover, regular consumption of oatmeal improves the nervous system. The best way to have this superfood is to take a warm bowl of oatmeal for breakfast. To enhance the nutritional benefits of this breakfast, you can add fresh fruits and nuts in it. It is best to opt for steel-cut rather than instant oatmeal. This springtime vegetable eliminates stress by supplying folic acid to the body and stimulating the secretion of serotonin. Low levels of folate have been associated with insomnia, mental fatigue, anxiety, and confusion. Besides, asparagus is loaded with vitamin C and vitamin B6. These vitamins are healthy for the adrenal glands and the nervous system respectively. When folic acid is combined with these vitamins, it becomes even more effective. This superfood is high in zinc, as well. Chronic stress is often associated with zinc deficiency. Spinach is another effective stress-soothing superfood you ought to include in your regular diet. This green leafy vegetable is rich source of magnesium which helps lower your stress levels. Plus, it facilitates normal nerve and muscle functioning. Apart from magnesium, spinach contains vitamin C, vitamin K, iron, calcium, folate, and so on. Thus, it protects the body from oxidative and inflammatory stress, too. No wonder, our macho Popeye the Sailor Man always kept this superfood handy! You can add this food in your soups, omelets, salads, sandwiches, etc. However, make sure you wash the crispy, curly leaves of spinach thoroughly before eating. This fatty fish is a good source of omega-3 fatty acids. It helps avoid surges in stress hormones and elevates your mood naturally. In fact, it is useful in preventing mood disorders like anxiety and depression. Plus, salmon works as a great brain food and hence, improves memory. Omega-3 fatty acids found in salmon, tuna, sardines, etc. are good for the heart, too. Milk contains a protein called lactium which is considered helpful in reducing stress as it has a calming effect on the body. Basically, it lowers blood pressure and reduces cortisone levels. The body releases this hormone during stress. Besides, the potassium present in milk helps relieve muscle spasms caused by anxiety and nervousness. In addition, milk is packed with vitamin A, vitamin B, calcium, magnesium, riboflavin, zinc, potassium, etc. Cow’s milk also contain iodine which is crucial for healthy thyroid function responsible for regulating your mood and metabolism. Stress usually disrupts sleep and causes insomnia. Thus, you can have a glass of warm milk before going to sleep. In case you do not like milk, make sure you include dairy products like yogurt, cheese, and cottage cheese in your diet. Apart from taking these superfoods, it is essential to adopt other measures as well. For instance, certain massages, exercises, and relaxation techniques can prove to be extremely useful for relieving stress. Positive visualization, too, works as a mind-clarifying exercise to ease stress. Plus, proper rest and sleep play an important role in reducing physical as well as mental stress.